I will be heading to Disney VERY Soon but there are just a few things that I want to be upfront and honest about. 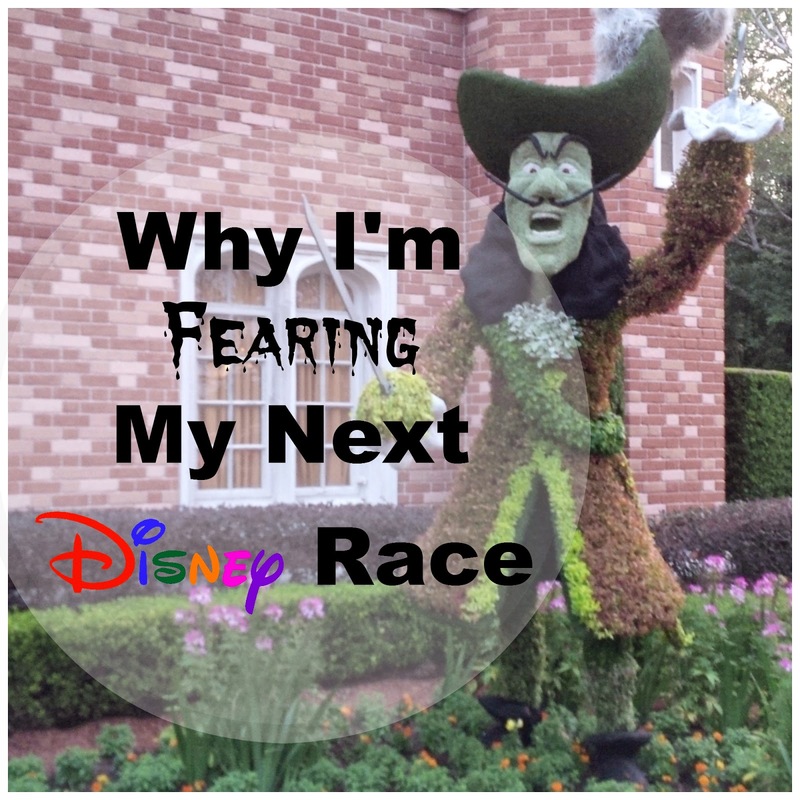 I am actually fearful about running my next Disney race. Ironically enough this race is called The Tower of Terror 10 Miler, so maybe I'm suppose to be terrified? Probably not. This will be my 8th Disney race that I've run so I know how this works, but it will be the first time I'm running Tower of Terror. Okay, since I'm being honest, I will lay it all out here why I'm a little fearful of this race. 1. It's in the dark. This will be my first night time race. I've never even practiced running at night. Last year at this time I read a race recap that my friend wrote about her first night time race and how she fell ill during the race. Being in the dark with those bright lights made her so sick that she couldn't finish the race. I have this incident in the back of my mind. I hope this doesn't happen to me. 2. Not only am I fearful of running in the dark, I am concerned about how to handle my day up until the race? What should I eat? How much rest should I get? What things do I need to do differently for a night race than a morning race? Also, will I be making a mistake running the 5K in the morning and then the 10 miler at night? 3. I'll be standing in the corral by myself and running all ten miles by myself. Well technically I'll be with thousands of other runners, but I won't have my best runner friends by my side. I know I can do this though! 4. Probably the BIGGEST reason I am nervous/fearful of running this race is that I have set a goal time and I am afraid to fail. THIS is the only race that I planned to run for time this year. 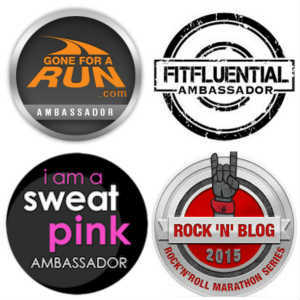 I took it easy on both of my half marathons this year and I know for sure that I did not run them to my full potential. I feel that I'm feeling good enough that I won't have to hold back as much for the 10 Miler ( I hope). The reason I want to get a good time is because this is the time I want to submit for corral placement for marathon weekend. 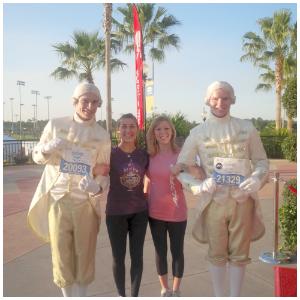 As you might know, My sister and I are running the Disney Marathon together. Lacey is always a Corral "A" runner but I'm more of the middle of the pack runner. I need a decent time so I don't have to make her move too many corrals back. Not that it should matter because we all start and finish at the same spot but #runnersguilt has set in. But in all, I am very excited about this Disney trip and the race ( kind of). I know the 5K will be fun and I'm not even stressed over getting to the expo because there is no merchandise that I just HAVE to have. I'm going to get a massage today, so hopefully I will be feeling refreshed when I get to Disney. Have you ever felt nervous/ fearful of a race? Good luck! I am sure you will have a Fantastic race! I am not a huge fan of night races either. I am usually in bed most nights by 10 and like you I am not sure what to do with myself all day! Looking forward to seeing your recap! Have fun! Have a great race Meranda. Go out and do your best. My friend told me there is enough light that you will be able to see. Make sure you hydrate enough during the day, and make sure to eat enough, but not gorge yourself. Eating is the tough part, but you can do it!! Just think, you will be doing the 5K with someone you love very much and that should be enough to get you through both races!! Good luck! I don't mind night time races but rD night time races start at the time I'm usually going to sleep. I sleep like an old lady, but it works for me. I'd much rather have an early morning race. I did an evening race (it wasn't dark, though) over the summer and it was weird, just knowing that I had to eat and hydrate all day long for the race. I'm sure you will be absolutely fine once you get going, but I totally get your fears right now. You're a consistent runner and you're gonna be just fine. I ran the ToT race back when it was a 13K, not a 10M. I did it on a lark because it happened to fall on the last night of a week long trip we had already planned. (That was when races didn't sell out on the first day they opened!) It had been a long week of park touring from sun up til sun down. And on the day of the race I got an early start, was on my feet in the parks ALL day, and ate a huge meal at Le Cellier before the 10pm race. I had also never run later than about 7pm at night. How did it go? It was a blast! It was crowded like all Disney races, and it was dark which was weird for me, and yes eating that giant steak right beforehand was a mistake, but it was still a blast! Enjoy! Your #2 concern is the same way I'm feeling about Wine and Dine this year. I signed up for the Jingle Jungle 5K and the half and have never run at nighttime! I'm hoping to not stress over race day and just have fun. Regardless of how you're feeling now, I know you're going to rock TOT this weekend! I can't wait to hear what you do during the day before the race since we really want to run Wine and Dine next year. I feel nervous before every run, not just every race, as I am worried about getting injured. Very cool. You're going to do great. #2 is the biggest one I'm unsure of when I prep for it for next year. I've run in the evening before but never quite that long of a distance. It's not even the over doing it during the day as just the other prep: being rested, hydrated, what it eat. Though I plan to do like you and do both, so it's like a split half marathon. Being afraid is normal! In the dark is actually nice, IMO, but the night races are not my thing. I'm doing a 5K this week at night but it starts at 7pm... and well, it's a 5K. ;) I will be pulling for you to reach your goal! Thanks Patty! The 5K at night sounds fun. I wish I would have been able to find a local night time 5K just so I could see what running at night is all about! I think you just have a case of terrible pre-race jitters, which is 100% normal:) I don't think you have anything to worry about, to be honest running in the dark is a lot of fun, but because of the type of race this is, it won't seem like the dark. Don't worry too much about the lights, unless you've had problems with flashing lights at night before, you have nothing to worry about. I have a feeling you're going to do great, and more importantly have an amazing time! Have a fun trip! Looking forward to hearing how it all goes, good luck!!!! You'll do great! I'll be cheering for you somewhere near the end, in DHS!! The heat has me scared..... I don't do well in heat BUT at least no direct sun right? I just keep telling myself its ONLY 10 miles not a half. I would recommend doing training runs before the sun comes up in the morning. That way you could get used to running in the dark. I'm definitely nervous about my next race, it's the first one where I have an actual time goal. I will definitely be disappointed if I don't hit it. I haven't done a night race, but I bet it will be a lot of fun! I ran a 5K when I was on vacation that was held at night that went really well. I think I had a donut and key lime pie that day - vacation in Florida! Seemed to work! Running at night time is definitely a whole different ball game than in the morning. I had issues with fueling before W&D and didn't feel so great after the race. But this is Disney and they make it so much fun, don't worry the lights aren't bad at all! You'll get it all figured out and will do great! I can't wait to hear all about your experience!